Posted October 18, 2016 by McIvor Farrell & filed under News. Ciaran O’Hare of McIvor Farrell Solicitors travelled to London alongside barrister Conan Fegan BL in order to perform a watching brief at the English challenges to the Brexit process. In proceedings in London, Lord Pannick QC, on behalf of Gina Miller, has argued only Parliament has the power to invoke Article 50 and initiate the UK’s exit from the EU, rather than the Prime Minister. The proceedings are concluding today. Posted October 13, 2016 by McIvor Farrell & filed under News. Northern Irish Lawyers, Ciaran O’Hare Solicitor (of McIvor Farrell Solicitors) and Conan Fegan BL, acting on behalf of the Victims Campaigner Raymond McCord, are currently performing a watching brief in London’s High Court today, in relation to the English challenges to the Article 50 process. Their appearance in today’s proceedings were announced by Lord Pannick QC, lead counsel in the matter of Gina Miller. Lord Pannick QC advised the court of the current position in relation to Mr McCord’s case, in that Mr Justice Maguire presided over a 3-day hearing last week and judgment has been reserved. The court in London welcomed this update on the Northern Ireland position. Thus far this morning, the court has been hearing submissions from Lord Pannick QC on behalf of Gina Miller. Essentially, the argument being made this morning is that only Parliament has the power to invoke Article 50, rather than the Prime Minister. Solicitor Ciaran O’Hare says that he welcomes the submissions being made by Lord Pannick QC on behalf of Gina Miller, as similar points have been made in Mr McCord’s application in Belfast and therefore this mornings submissions support Mr McCords case. He also says that Mr McCord’s case does go further, as in Mr McCord’s case it is argued that Northern Ireland has a veto to Brexit based on the contention that the people of Northern Ireland alone are sovereign in relation to any constitutional change for Northern Ireland. The proceedings in London will last for the rest of today and then recommence on Monday and Tuesday. Posted October 9, 2016 by McIvor Farrell & filed under News. “Sovereignty over constitutional affairs has been ceded [by the UK]. It is not the relationship, as it might once have been, between a dominant partner and a submissive partner. Mr McCord is pleased with the legal arguments that were made in court on 4, 5 & 6 October. Upon the conclusion of the hearing the court indicated that it would be giving the matter its immediate attention. Posted September 6, 2016 by McIvor Farrell & filed under News. Belfast solicitors McIvor Farrell welcome the attitude of HMG that current Judicial Review proceedings taken on behalf of Raymond McCord in relation to the implications of Brexit in Northern Ireland be expedited as soon as possible. Before Mr Justice Maguire (QC at Belfast High Court), the Government’s representative confirmed that it was in the interests of all the parties that this matter is determined by the Court without delay. Posted August 13, 2016 by McIvor Farrell & filed under News. Victims campaigner Raymond McCord has launched the first legal challenge in Northern Ireland to the UK leaving the European Union. Mr McCord, whose son Raymond Jr was murdered by the UVF in north Belfast in 1997, is believed to be the first person in Northern Ireland to issue proceedings over Brexit. He is taking the case amid concerns that European peace money which goes towards victims of the Troubles may be discontinued. The challenge centres on the Government’s response to the June 23 referendum result. “an important constitutional case which engages the Northern Irish public interest in a way that no other case has or is likely to for many decades”. Ms Tanya Jennings recently joined forces with McIvor Farrell Solicitors in April 2016 after working for almost five years in the Lurgan Portadown area. She now heads up the Matrimonial Practice at McIvor Farrell Solicitors and offers a wide range of legal services and advice on matters including Divorce, Separation, Financial Settlements, Domestic Violence and Children’s Law issues. She also continues to offer services and advice to people and clients in the Lurgan/Portadown area and to attend at their local courts in the Craigavon and Newry area. Tanya graduated from Queen’s University Belfast in 1994 and was admitted to the Roll of Solicitors in 1996. Tanya has dedicated her career to the practice of Children’s and Family Law and deals sensitively and passionately with the client issues involved. She has extensive experience in all family matters including Private Law matters such as Divorce, Separation, Financial Settlement, Child Custody and Contact and Relocation and Abduction cases. 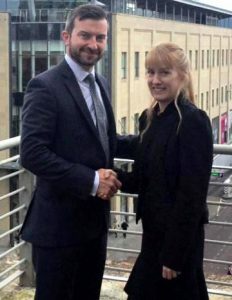 Ms Jennings has also been involved with numerous Public Law cases and non-accidental injury cases when Social Services have become involved with the family. Tanya has an excellent track record of successfully reuniting children with their parents and providing top quality advice and ensuring reunification within the family home. Tanya is a member of the Law Society of Northern Ireland Children’s Panel and also on the Children’s Panel for the Northern Ireland Guardian ad Litem Agency where she offers specialist advice to children through the Guardian ad Litem. Tanya also specialises in Domestic Violence cases and throughout her career has worked closely with Women’s Aid and has been an advisory member of their Management Committee. She has successfully secured Non-Molestation Orders and Occupation Orders to protect victims of domestic violence and to ensure criminal prosecution of the perpetrator. Tanya has represented a vast number of clients throughout her 20 year career in Divorces and Financial Settlements and secured an optimum settlement in favour of her clients. Posted June 17, 2016 by McIvor Farrell & filed under News. Belfast Solicitors McIvor Farrell attended a high level meeting with senior police on the 16th June 2016, on behalf of the family of murder victim Christopher Meli who was brutally murdered on the 12th December 2015, to address concerns they had in relation to Police failures to keep them advised of developments in the investigation into their son’s murder. This was the second occasion that we had to attend meetings on behalf of the family due to their frustrations with regard to the progress and developments in relation to the investigation. Following on from the meeting Police made a fulsome apology to the family with an undertaking to keep them well informed in the future with regard to progress and developments. Paralegal Aine McElwee who attended the meeting speaking afterwards noted that while the family could have made a formal complaint to the Police Ombudsman this was not necessary in this instance, since the family’s needs required immediate action and the informal resolution process we proposed was the most direct and expedient way to deal with the issues in hand. We are pleased to have brought this matter to a swift and successful conclusion avoiding a protracted complaints process. Should you have any concerns in relation to the Police handling of your case or concerns about a defective prosecution please contact us immediately. Posted June 16, 2016 by McIvor Farrell & filed under News. Expertly researched by business analysts using the latest information available the Plimsoll Analysis is the definitive guide to companies within the legal sector in the UK. The purpose of the analysis is to provide leaders of major companies within the UK Legal Services Industry a comprehensive and accurate probe into how well their company is performing within their niche industry. We are featured on page 1184 of the latest Plimsoll Analysis. Whilst these are challenging times for the legal profession, McIvor Farrell Solicitors Ltd are delighted to have secured a place within the Top 100 fastest growing companies showing sustainability within a competitive market and continued profitability. This is a current Judicial Review case involving police powers of arrest in respect of breaches of Civil Injunction Orders made pursuant to Order 14, rule 6 of the County Court Rules and Articles 3 and 5 of the Protection from Harassment (Northern Ireland) Order 1997. Injunctions obtained pursuant to Articles 3 and 5 of the Protection from Harassment (Northern Ireland) Order 1997 are relatively common within the jurisdiction of Northern Ireland. It is, therefore, perhaps surprising that there is no Northern Irish authority on the points raised by the Applicant. On that basis, this is undoubtedly a novel case. There is a significant public interest point in respect of this case, as it hoped that judicial guidance is given to aid current and future holders of such injunctions, as well as police officers generally. Posted June 15, 2016 by McIvor Farrell & filed under News. We are delighted to announce the recipient of the McIvor Farrell Prize for the Best Performing Student in the Negotiation Category at the Northern Ireland Institute for Professional Legal Studies to be Ms Helen Smyth. We take great pride in our sponsorship of this prestigious award and look forward to the Awards Ceremony at Queens University Belfast on the 29th June 2016 when our Litigation Department Head, Mr Conor Woods, will present Ms Smyth with the award.